FAIRFIELD — The Public Works Department will be filling its trucks next week, but not with the usual dirt or rock or asphalt. Instead, they will be filling trucks with food as they participate in a food drive that’s all part of National Public Works Week, which runs from May 20 - 26. According to Public Works Director Joseph Michelangelo, “Fill a Public Works Truck” is an annual event, and Fairfield’s donations will be brought to Operation Hope and the Connecticut Food Bank. But the department isn’t using run-of-the-mill boxes to collect non-perishable foods. Employees have build collection boxes that resemble the department’s orange trucks. Michelangelo said the “trucks” will be placed at both library branches, Sullivan-Independence Hall, Old Town Hall, the Police Department, the Senior Center, and the Recreation center. Additionally, he said, they will be showing up at some Little League and soccer games. 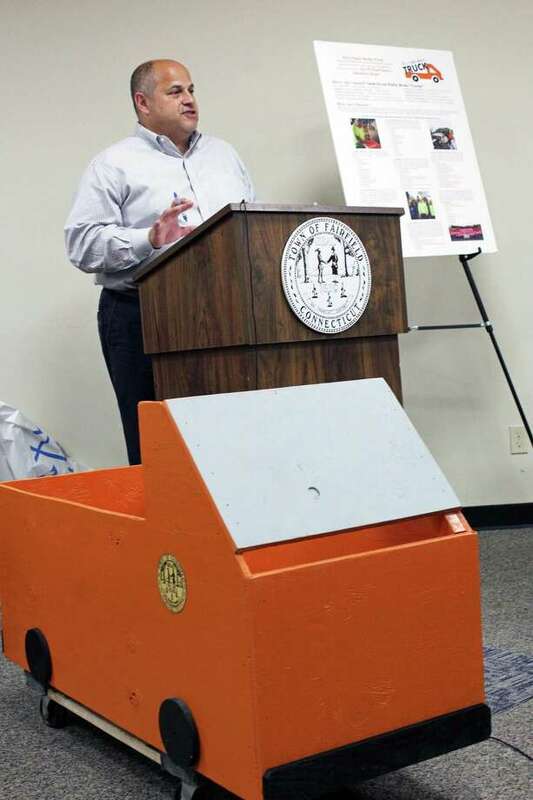 “We’ll fill up the little trucks and hopefully have two big trucks going to both our locations,” Michelangelo said, when he unveiled the collection “trucks” at the Board of Selectmen meeting. First Selectman Mike Tetreau said the Public Works crews have helped the town get through a very tough winter, but their work is often out of the spotight. “It think it’s a tremendous value statement, a tremendous contribution,” Tetreau said, of the food drive. It is a statement, he said, of how much the Public Works team values the town. “I hope the community really embraces this,” Selectman Chris Tymniak said, and recommended residents be prepared to have some extra food with them when visiting town buildings during the collection effort. Michelangelo said there will be information on the food drive is on the department’s web page, and information was sent home to students via the Board of Education’s message system.